A few of these stars are made every once in a while. 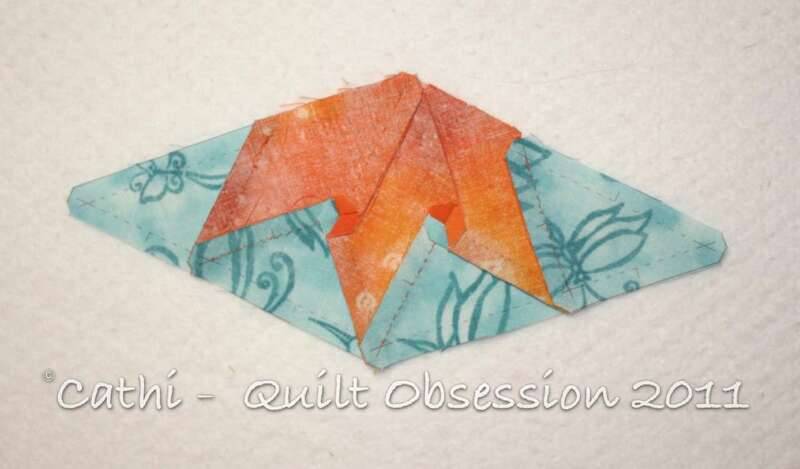 There are now 18 of them done, each measuring 6″ from tip to tip. The box in which the pieces reside is almost empty. There are only 12 stars left to make and then I can free this box up for another project. At the rate I’m going on a few of these smaller projects, I think there may be a flurry of finishes over the next while. 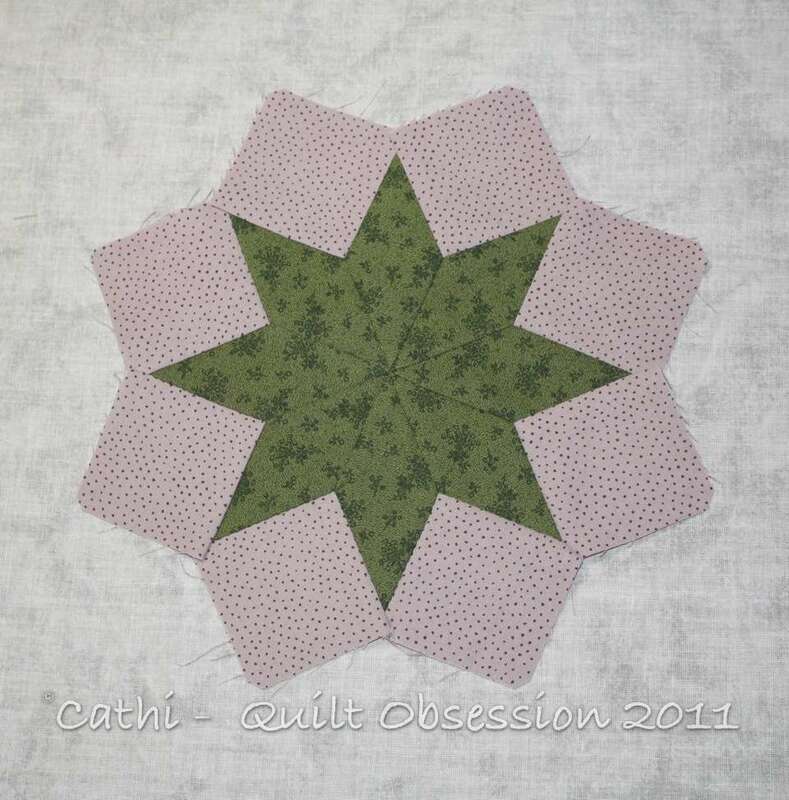 Scrappy Star and the red and white Feathered Star/Sunflower quilt remain at the top of the list but sometimes it’s nice to work on a small project. 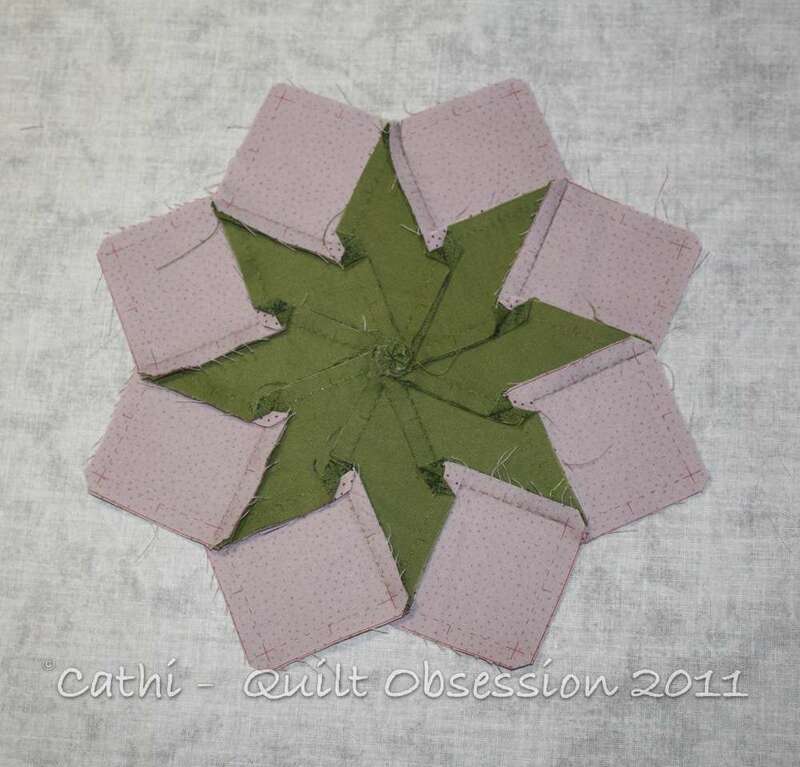 A pink star wall hanging sounds like it might just fill the bill. 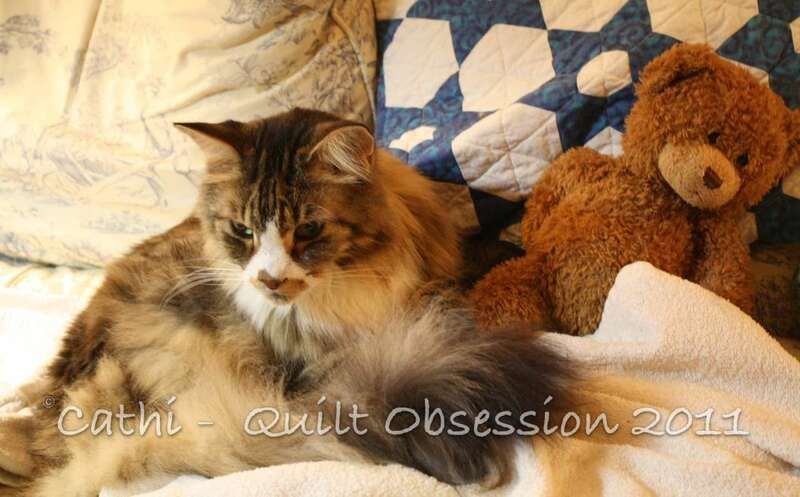 There’s an idea nagging away at me to make a quilt using a purple batik and … well, the and isn’t quite yet decided but that would mean another in the series of two-colour quilts I want to make. 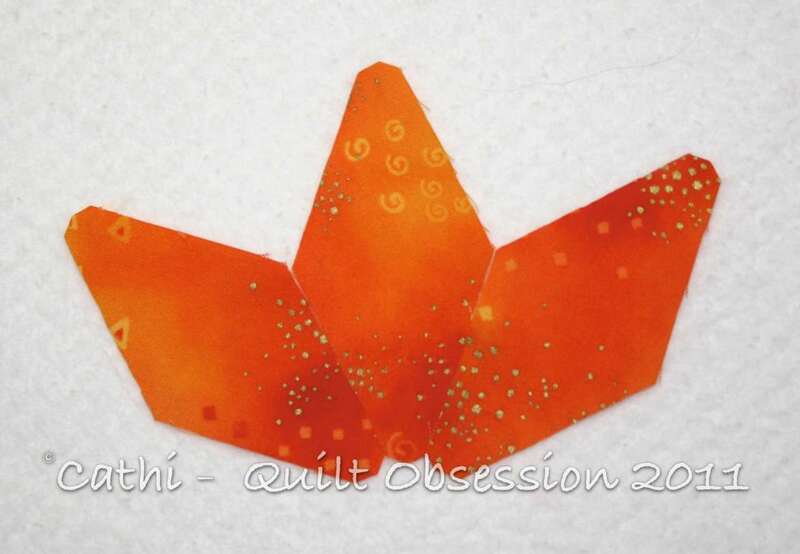 I may play with that this weekend for a bit to see if I have anything on hand that works as the other colour. Today is a big day in the household. It’s Mr. Q.O.’s birthday. 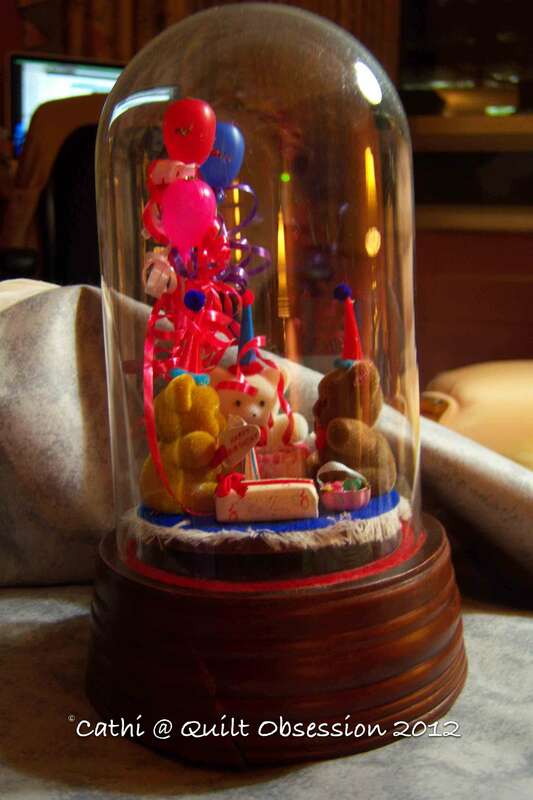 The birthday bears will have to come out to sing Happy Birthday to him. It was incredibly mild here yesterday, definitely felt like spring. But very windy. Baxter was up on the windowsill repeatedly. Later on, he was resting up in his chair. Over the holidays, this project made its reappearance and is on the list of those I want to finish up sooner rather than later. 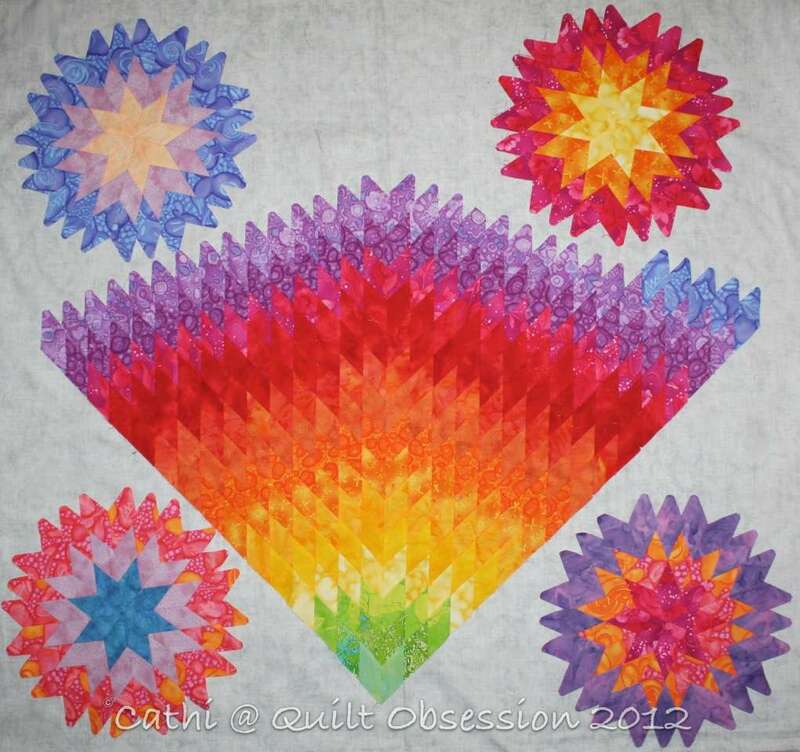 There are a couple more rows of diamonds to add to the rainbow centre and then I’ll set it together with the four sun blocks. We didn’t get a picture of the back of the rainbow yet, but I spent a fair bit of time pressing it on the weekend. Once again, I had left the pressing too long. However, now that I’ve got this part pressed I will press after each of the remaining rows are added. Lesson learned once again! Pink stars, that is. Not sure what these are going to turn into, but making these stars just seemed to have to happen. So far there are 16 of them. They will be 6″ if finished as LeMoyne Star blocks but that’s completely undecided at this point. They may end up as the centres of a different block altogether. Or perhaps they’re going to be a border on something else. I’m really just having fun making stars. Baxter has been very busy the past week, chasing leaves as they fly by the window and watching as the gardeners prepared the flowerbeds on the roof garden for the winter. 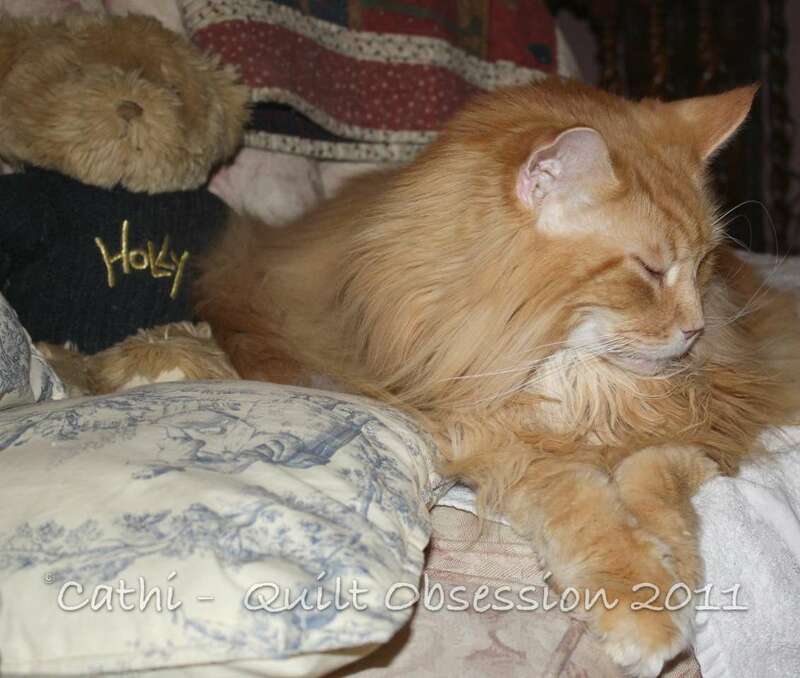 Here he was relaxing on the couch. 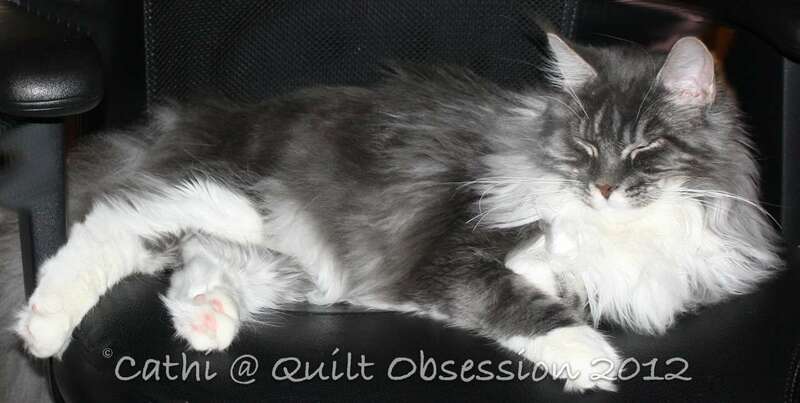 Last week I was dealing with fatigue from a treatment. I can feel my energy level increasing and am looking forward to getting back to blogging this week. Once the lime was added to the blocks and the centre LeMoyne Star made, the name had to be Fruit Salad. It measures 32 inches square. 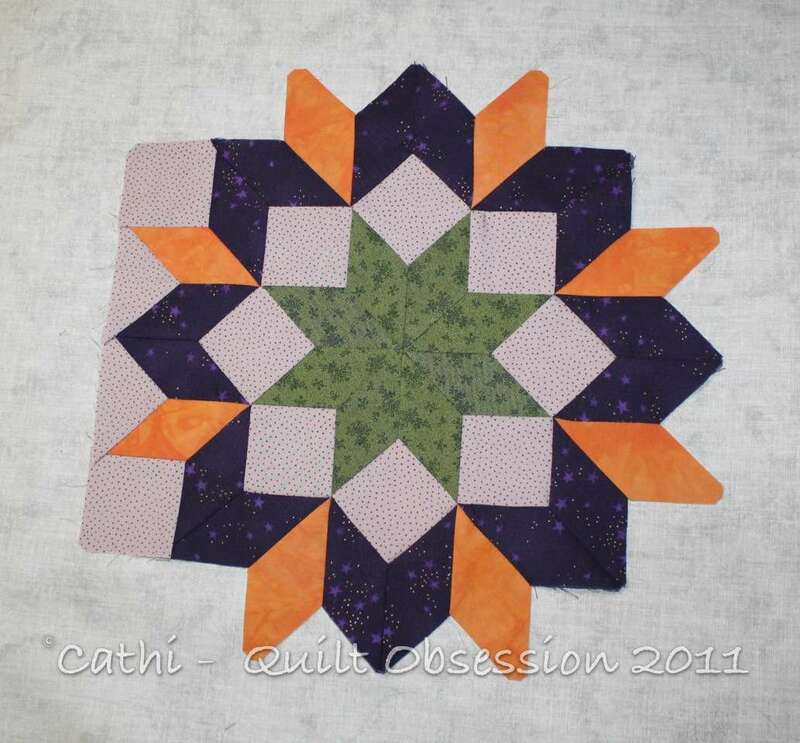 The blocks were hand pieced, but the sashing was added and the top was put together using the machine. 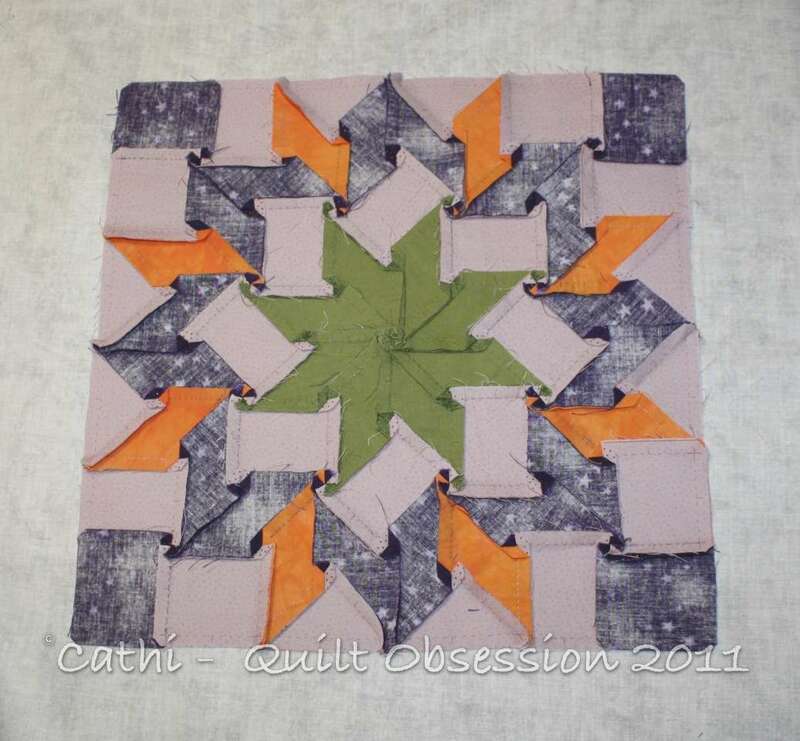 I think I’m going to use the same purple batik that’s in the blocks for the binding. 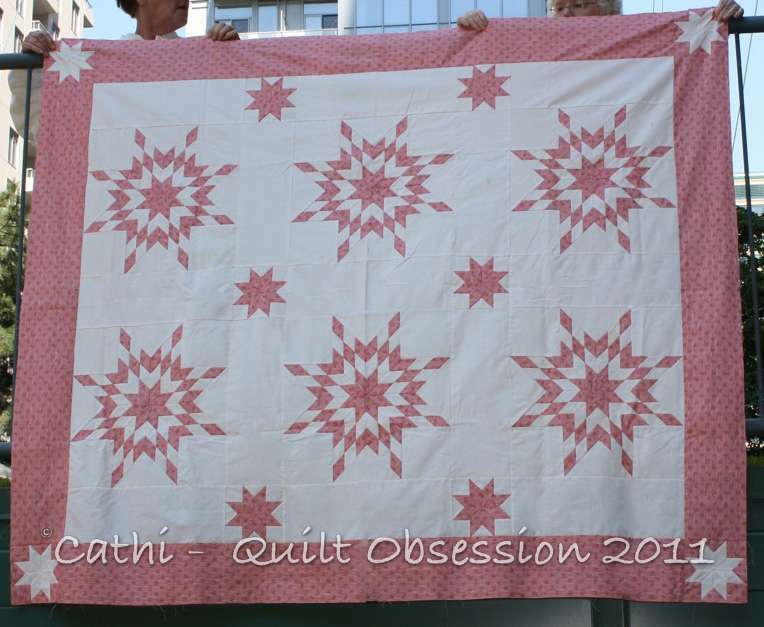 I used the Inklingo 6 inch LeMoyne Star collection for this quilt. The blocks went together in no time but, for some reason, had to sit for months on end before I finally put the little top together. 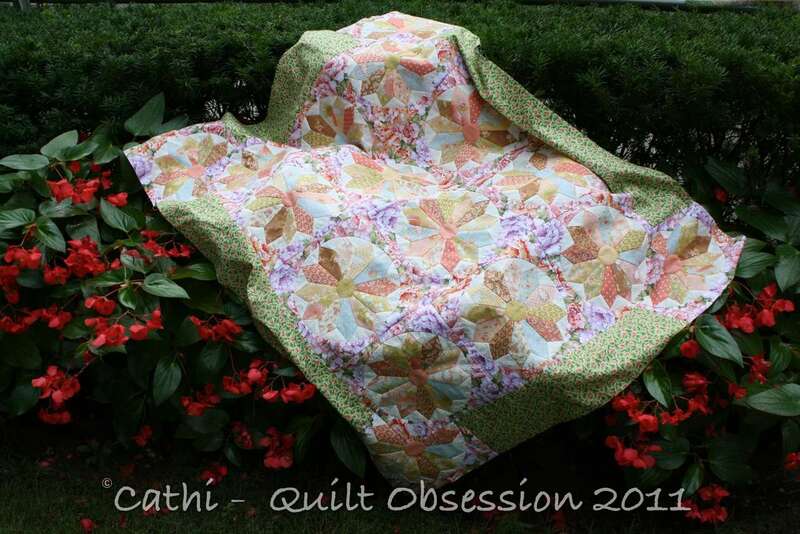 We took photos out on the roof garden yesterday and got this shot of the Dresden Plate quilt top. It looks better in natural light than it did with the flash from the camera. 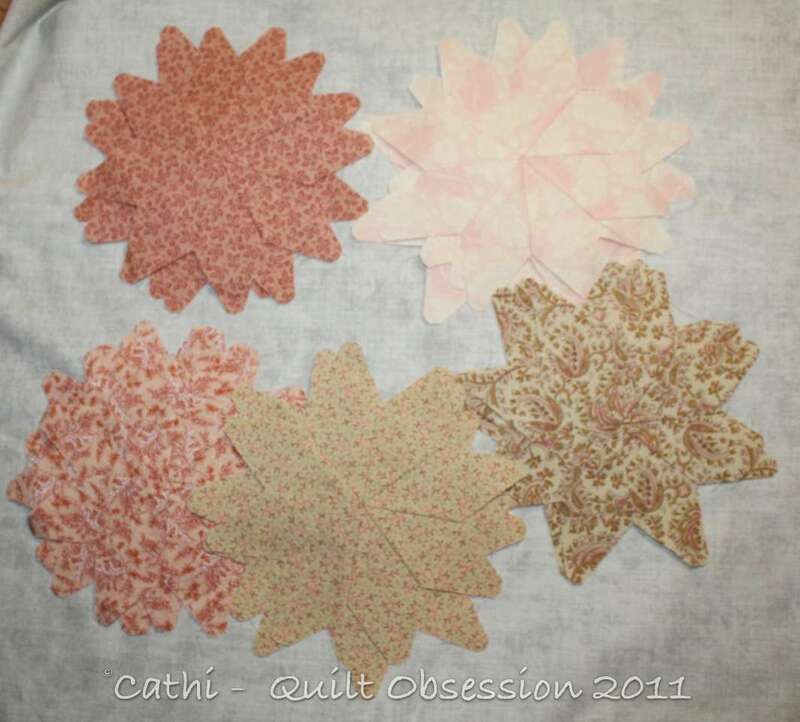 A quick inventory of the quilt tops I have ready to quilt was done last night. 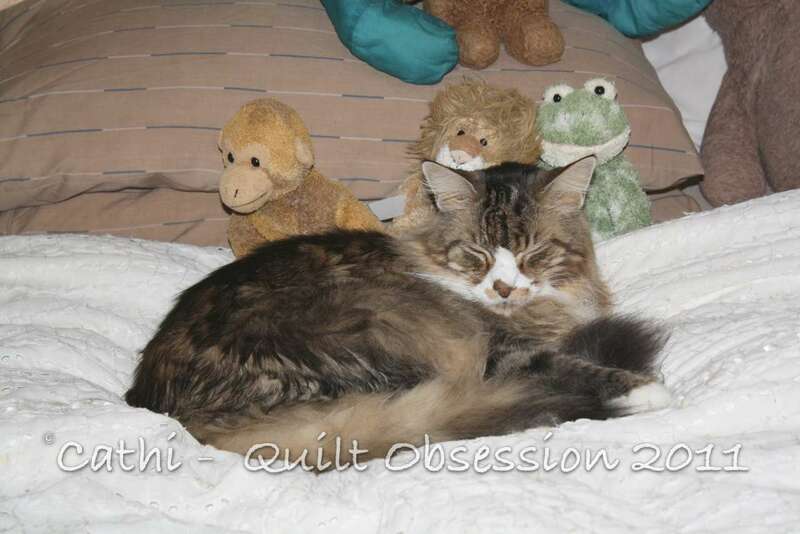 There are 14 tops now in line waiting to be quilted. 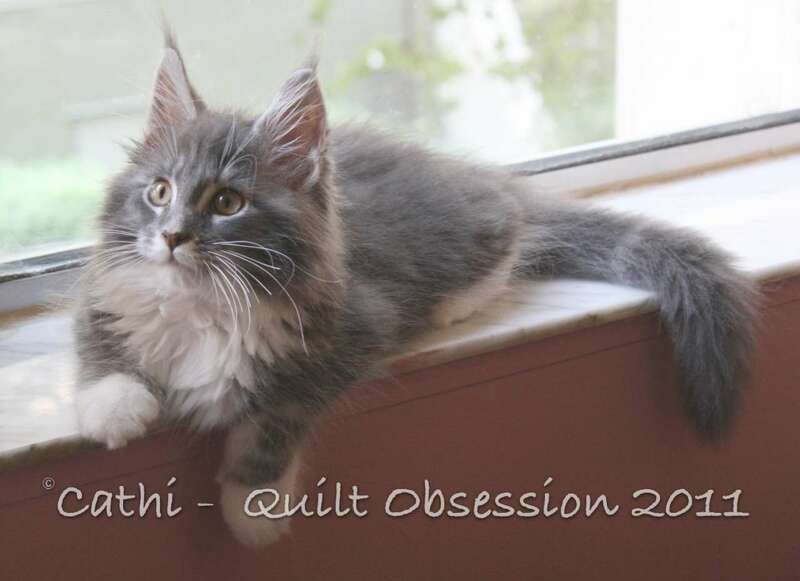 Think I’ve got to make up a muslin/batting sandwich and get some practice in on my hand quilting as it has been ages since I’ve done any and I want to hand quilt at least half of those tops. The first thing I’m going to do is measure them all and then figure out what battings I need. Then I’ve got to get some backings ready. Baxter posing for the camera. It’s hard to believe he’s not even 5 months old. 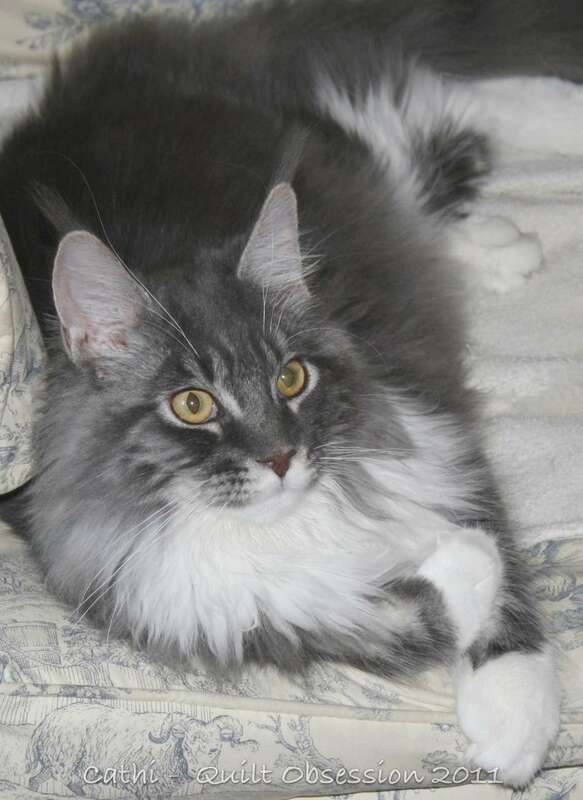 We think he’s going to be a big kitty when he’s through growing … in about three and a half years. These 4 blocks have also been bumped up the list to be finished. 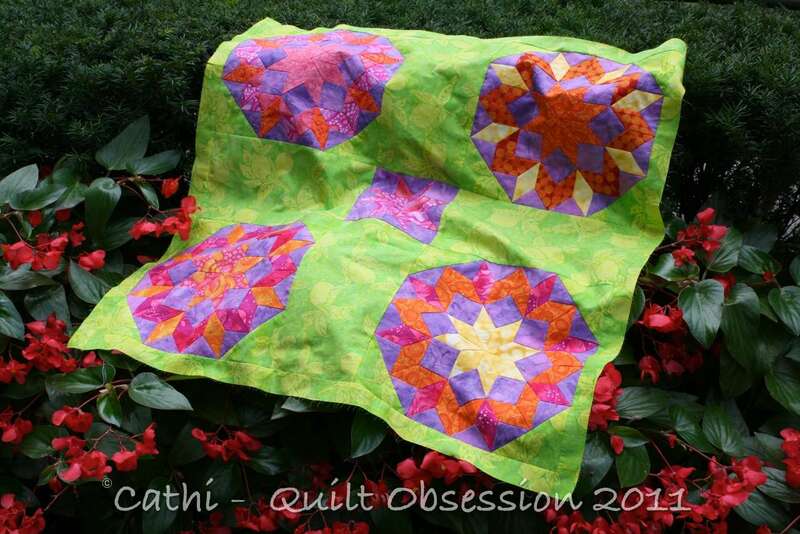 The lime batik I’ll use to set them is ready and the little quilt top should be done in no time. 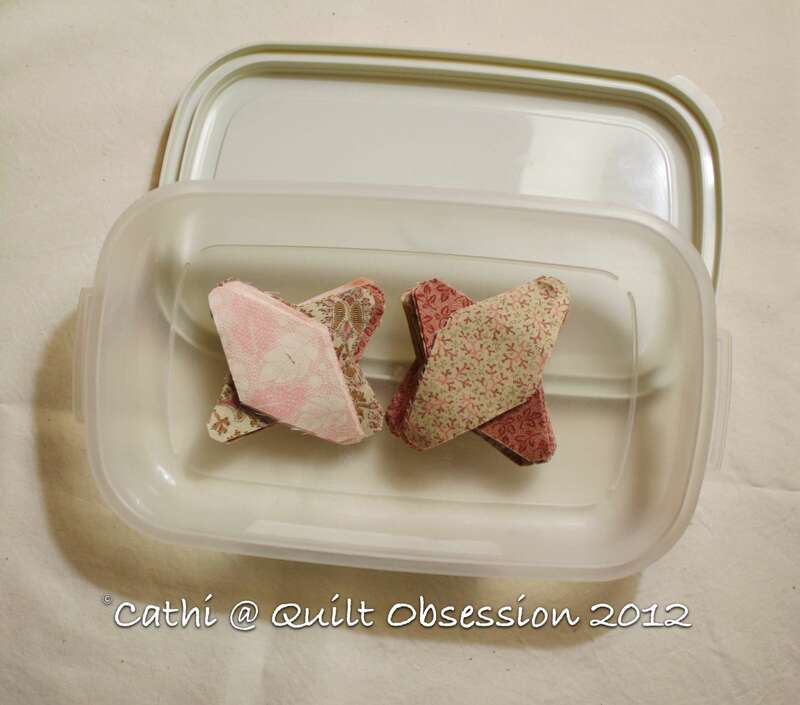 The blocks have been sitting for ages and the lime batik is washed and ready. It has been quite a week around here. Last Thursday and yesterday, Mr. Q.O. had cataract surgery. The difference is absolutely incredible. He can basically now throw away his old glasses and use drugstore readers. 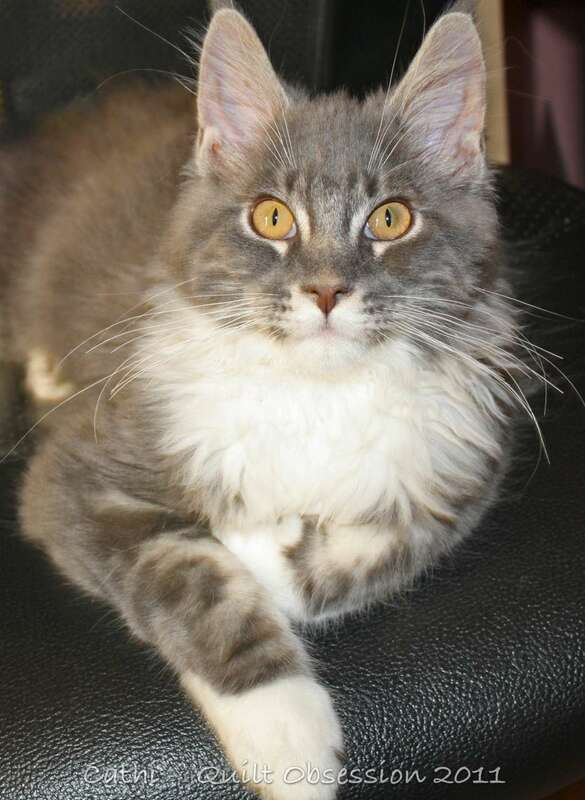 I was able to sit with him in the pre-op area until the doctors came to get him and the nurse told me as soon as he was out of surgery – less than 15 minutes. What an amazing process! The nurses in the pre-op and recovery room were wonderful and we both got a hug from one of them as we left. Baxter sprawled out under a desk yesterday afternoon. 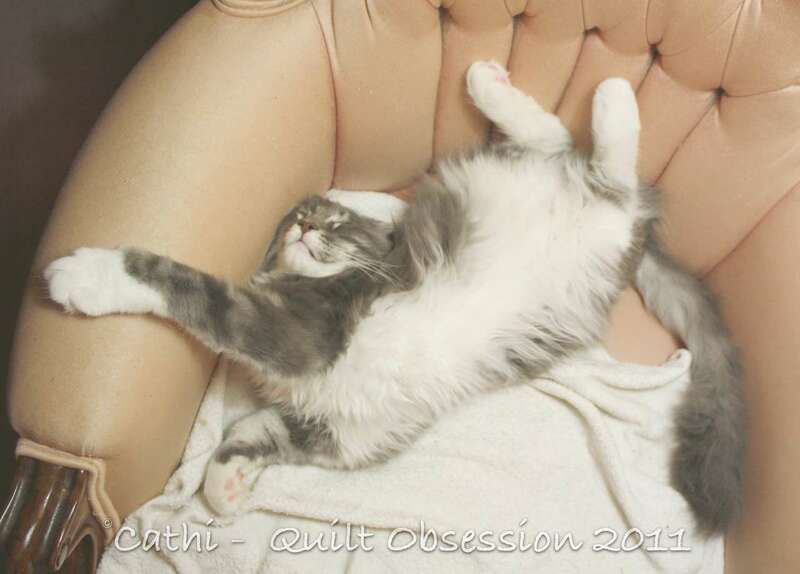 It really doesn’t look like he could possibly be comfortable, but this is how he likes to sleep. Last week I spent some time going through the various partially completed projects. Some of them have been relegated to the closet for now. Others have been bumped up the list to be finished. 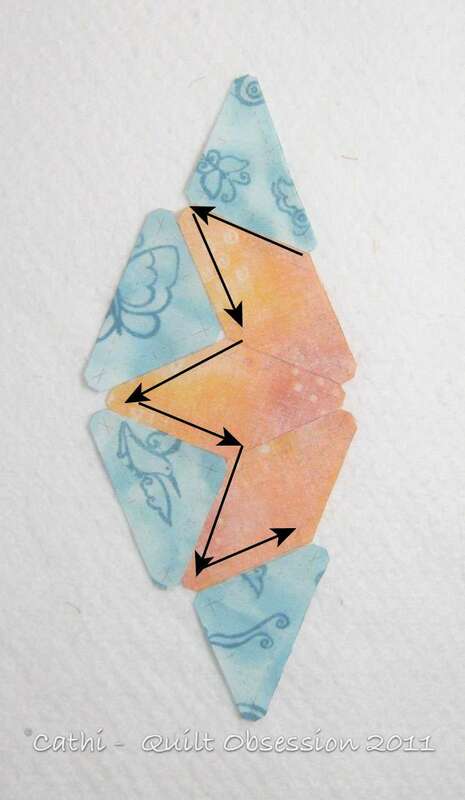 The Sky Quilt is one of those that’s going to be worked on now. 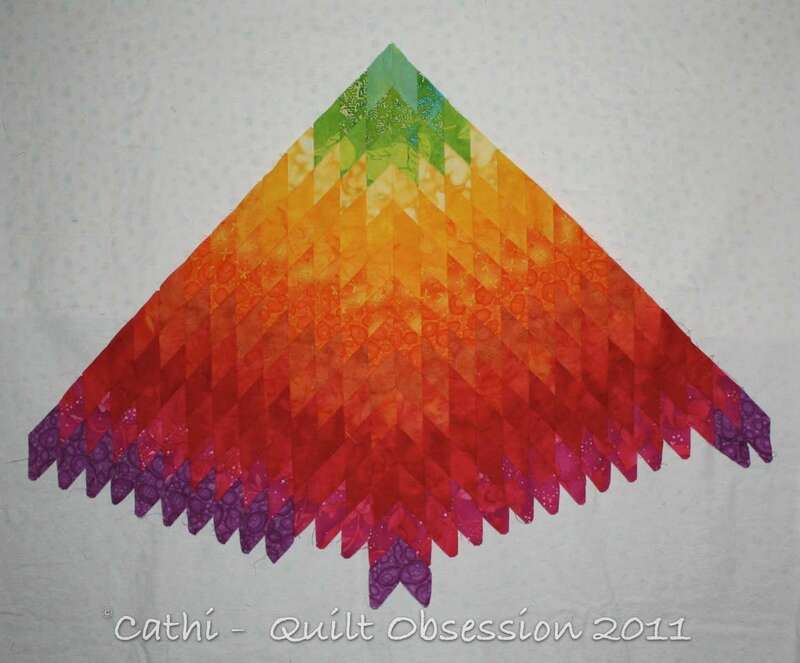 This picture is of the rainbow that will be, I think, in the middle of the quilt. Another few rows of diamonds will be added in purples and blues and that part will be done. 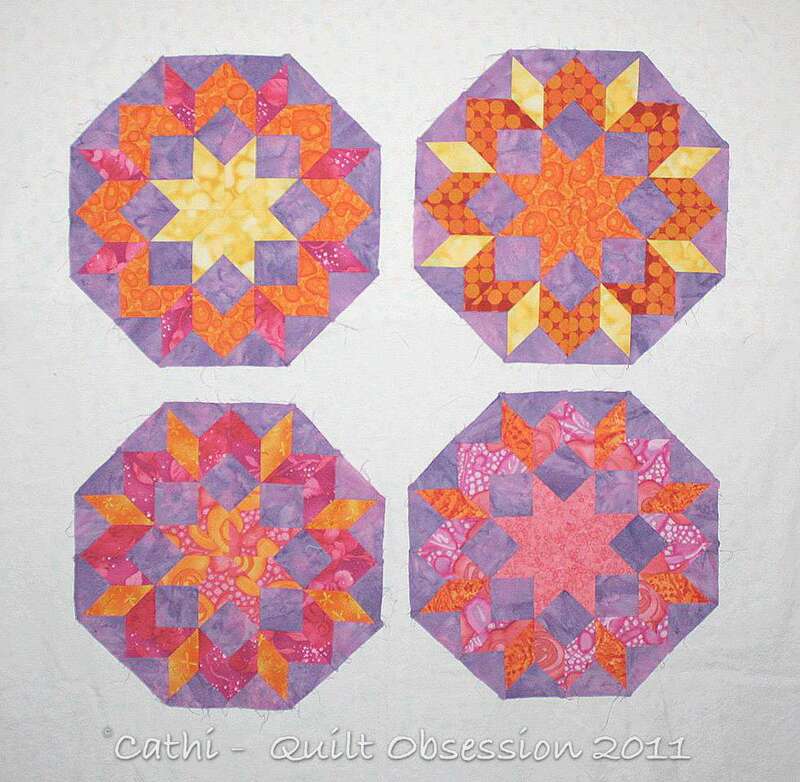 These four blocks will be in the corners of the quilt. 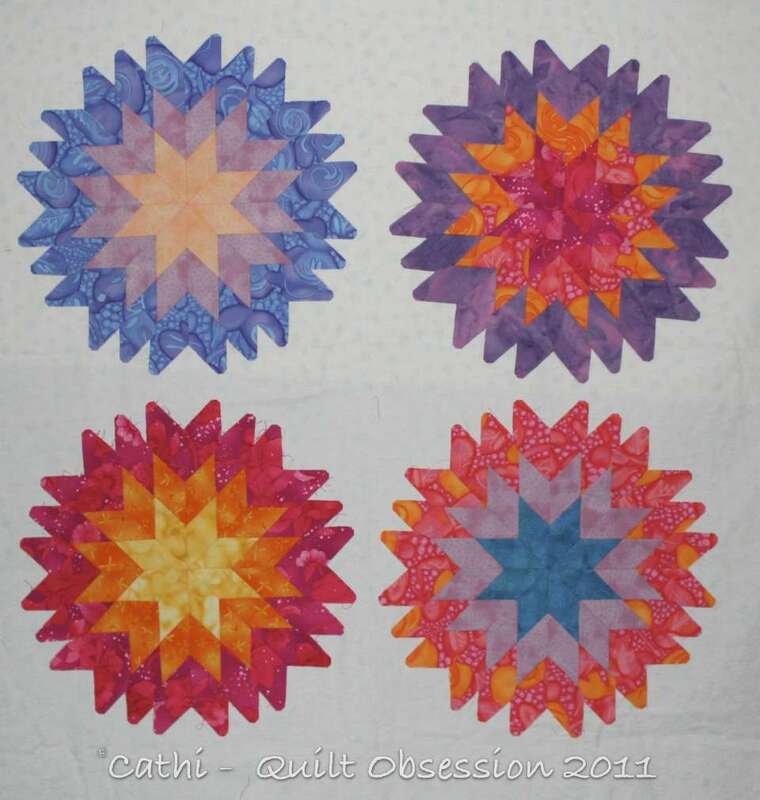 I remember they struck me as being sunset and sunrise colours, which is what gave me the idea of calling it the Sky Quilt. The pieces I need to finish the rainbow were ready and waiting, so I’ve started adding the final few rows to it and will hopefully have the top finished within a couple of weeks. The fabric I had selected for the background was easily located and is washed and ready to go. The best part of revisiting the older projects? Once I had them out and up on the temporary design wall, I almost immediately had ideas for finishing a few. 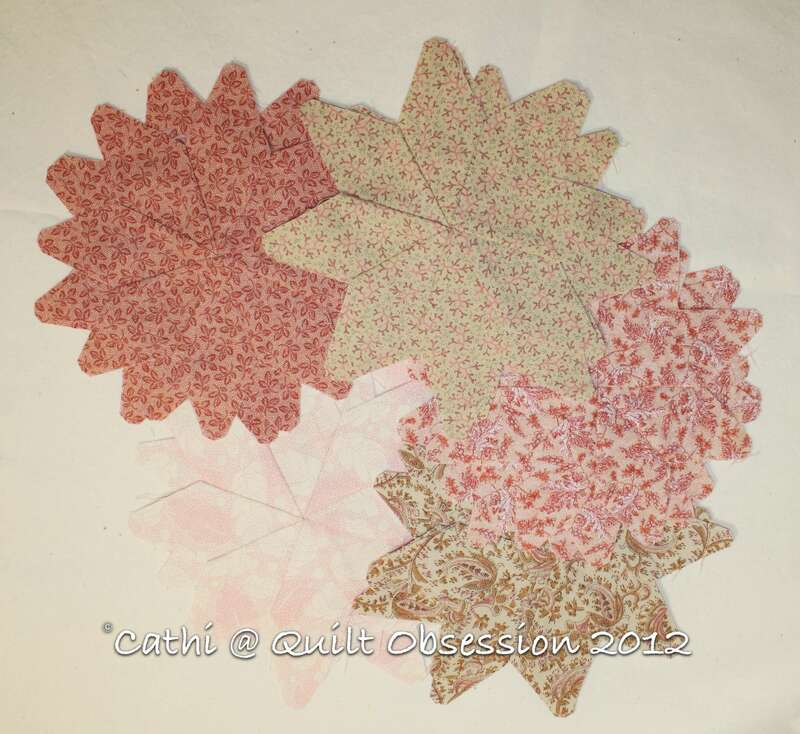 There are three of these projects that will be turned into quilt tops relatively quickly. Baxter has a new trick. He brings us his favourite toy, drops it at our feet and waits for us to throw it for him. First he has to rest up and be ready for some serious play time. A friend asked me how I’d make one of the Carpenter’s Wheel blocks so I decided to do a mini tutorial on it. Smudge is watching intently. 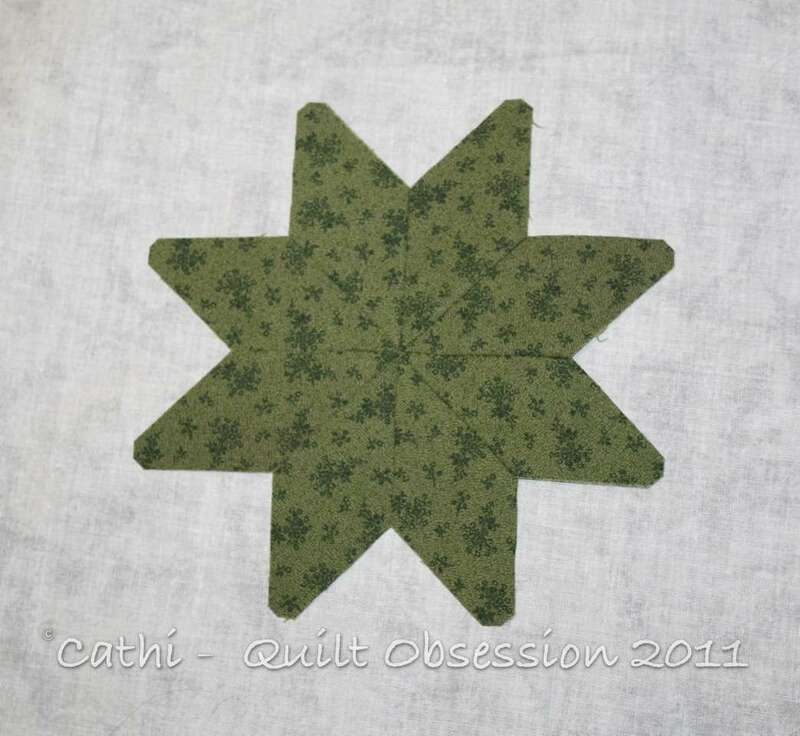 The first thing I did was figure out what I needed to print, which was 8 diamonds for the centre star, 8 squares in the background fabric to surround the centre star, a total of 24 other diamonds for the frame around the star/square centre, 8 QSTs and 8 more squares in the background fabric, and 4 squares in another colour for the corners. Once that was done, it took only minutes to print and then cut out my pieces. The first step was to make the centre star. 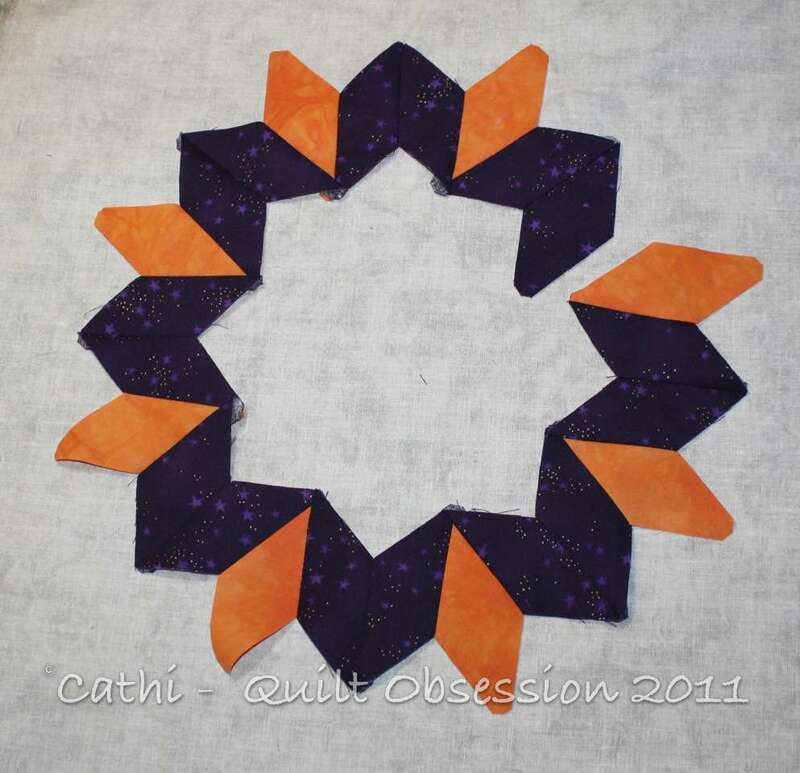 The next step is to add the 8 squares around the centre star. As I hand piece, I look for these continuous stitching possibilities. Two lengths of thread later and all the squares were added. Pressing after each round isn’t normally something I do, but this time I did. 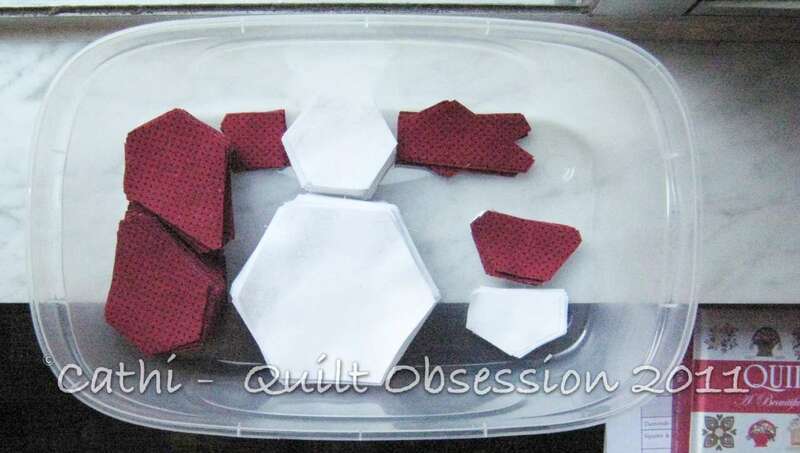 The next step is to make the frame of diamonds that will surround the centre star/squares. 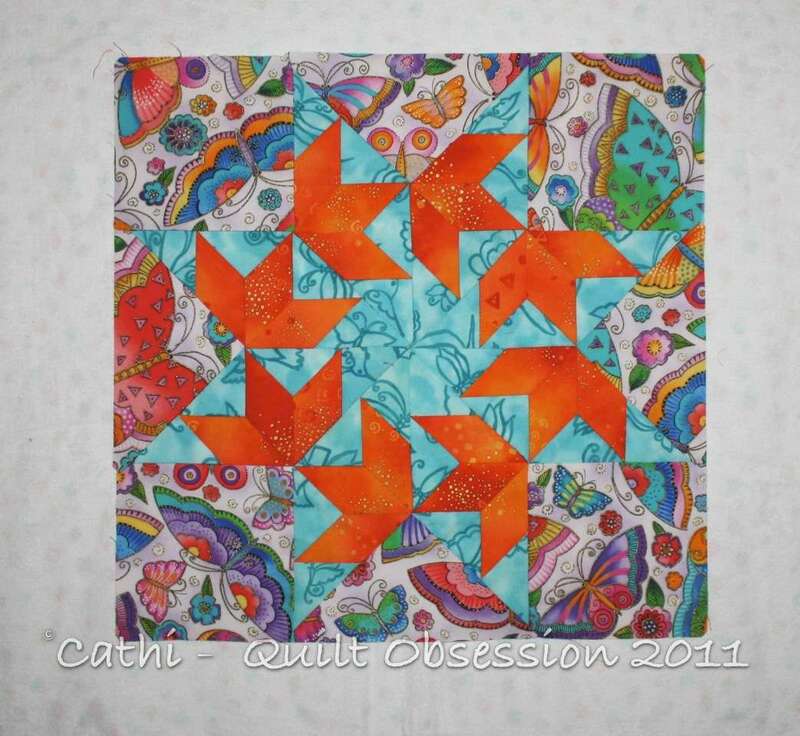 As I was using two colours, I first stitched the purple diamond pairs and then added the orange diamonds in between and continued joining them until I had the frame ready. Another opportunity for lots of continuous stitching and a few threads later, the frame is added. In fact, it went so fast that I had started to add the final squares and QSTs around the block before I remembered to take this picture. The final step is to add the background squares and QSTs around the perimeter. Again, lots of continuous stitching. 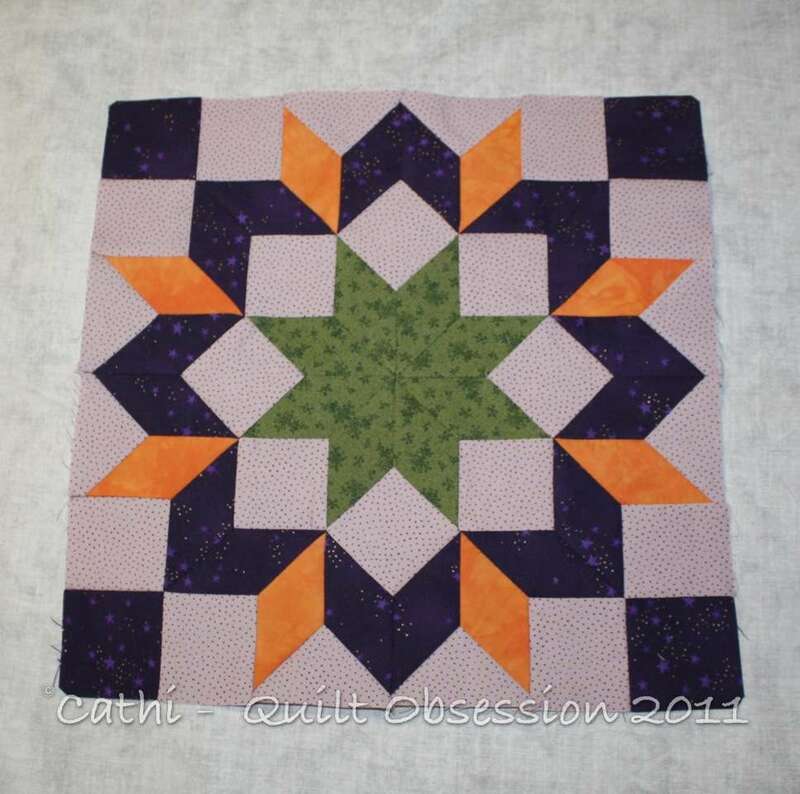 When adding the squares and QSTs, I left the corner squares until the end so that I could take advantage of the continuous stitching opportunities and then went back and added the 4 final squares. It presses beautifully and lies flat as can be. Because of the perfect stitching lines and matching points printed with Inklingo, making this block is not difficult at all. 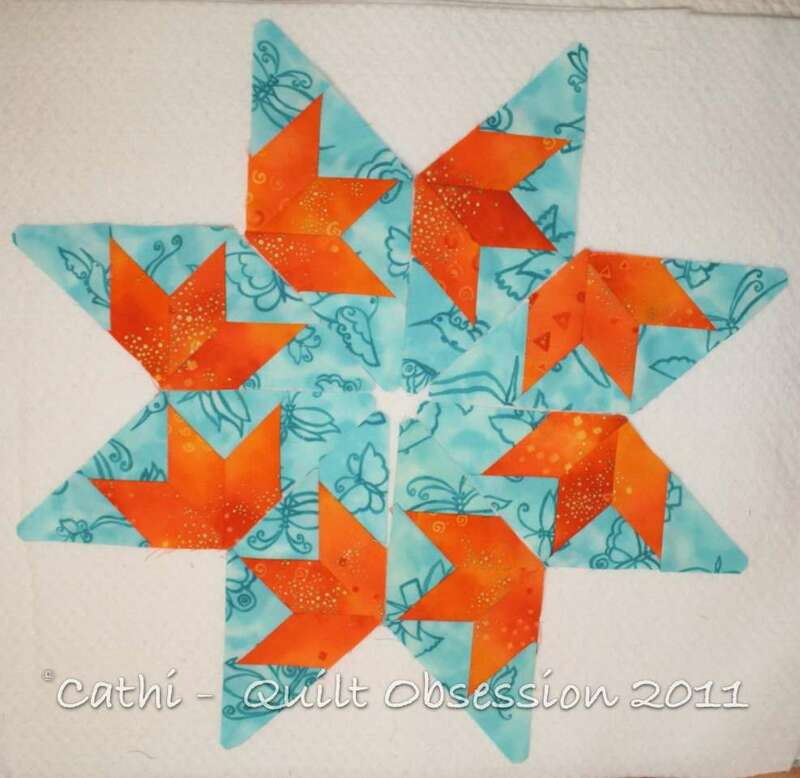 I used the 6 inch LeMoyne Star collection to make my block, which finishes at 12″. 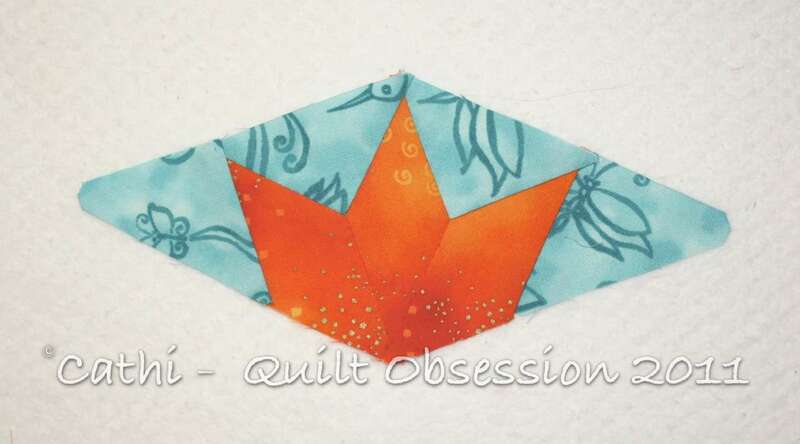 The fabrics I used for this block really had me out of my normal comfort zone as far as colour goes. It was interesting stitching and now that it’s done, it’s on its way to a friend. 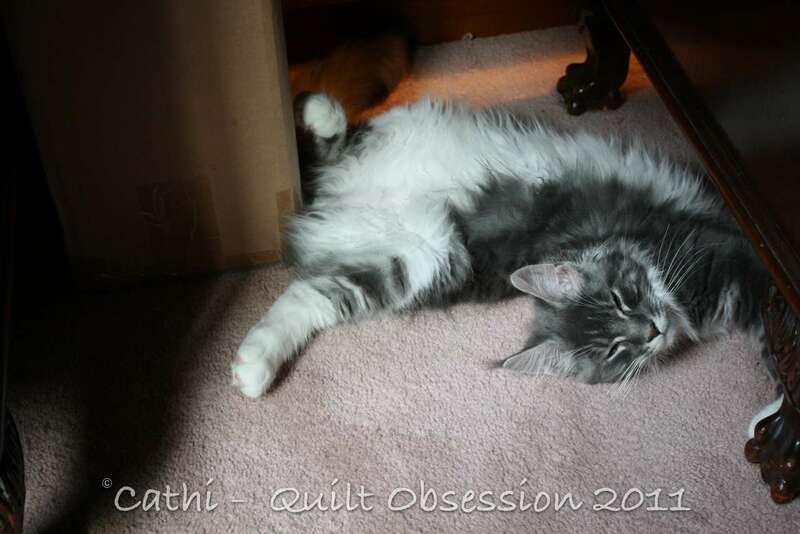 Lester found this whole thing so relaxing that he fell asleep! 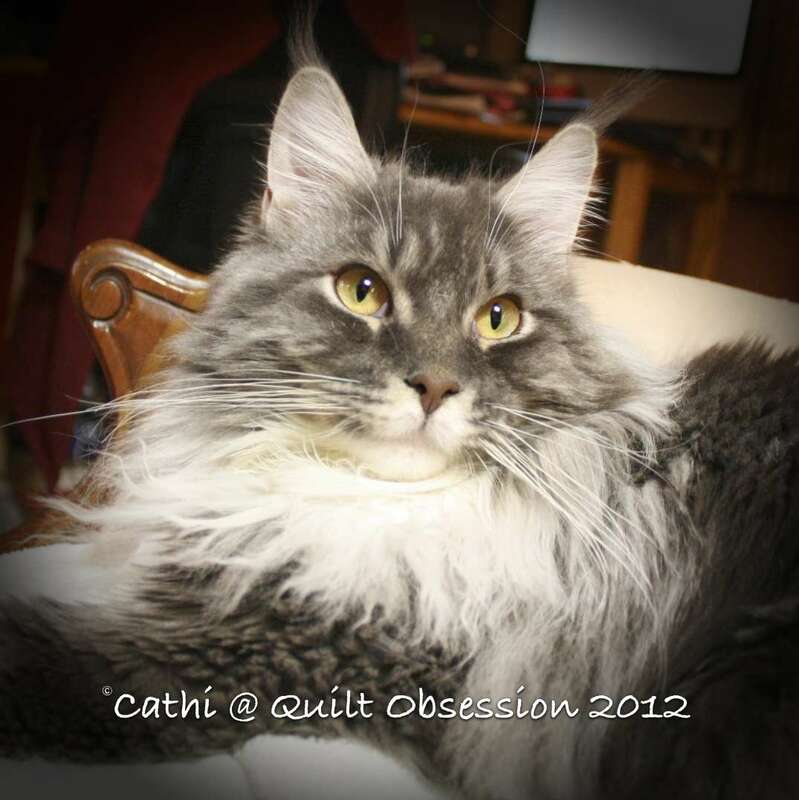 He’s continuing to improve and has been playing with toys, is eating on his own and seems more like himself every day.